The Women’s Art Library/Make again joins with the journal Feminist Review to invite writers and artists working with text to present proposals for a £1000 bursary supporting three months of research in the Women’s Art Library as part of a creative project. This call is open to all, including students. CALLING ALL MEMBERS OF SOUTH LONDON WOMEN ARTISTS. Sunday 27 February– Saturday 26th March 2011. This will coincide with Southwark’s 6th Year of Celebrating Women, and 100 years of International Women’s Day on 8 March 2011. Your work might be inspired by a writer, a genre or a book, but if not, your work could be opened up to new meanings with the help of a new title. ‘The Remains of the Day’, ‘Far from the Madding Crowd’ or an inversion like ‘ a View from a Room’. It would be great to enrich the show with texts – so please tell us about the work you are submitting! This Spring and Autumn exhibition is now a fixture in the calendar and a good way to keep up the profile of our artists in a space that is fast establishing itself as a venue to view and buy small original artworks. The library is a well used resource centre and the exhibition will be seen by large numbers of people during the month of March. The previous shows have sold well and there have been several ‘after show sales’ proving that keeping our work in the public eye is important and effective for us as a group and as individuals. £10.00 if work accepted. The slightly increased fee is to cover the extra cost of producing a catalogue to celebrate this exhibition, and to develop publicity. A commission of 10% to SLWA will be levied on sales. Works will be for sale unless specified otherwise by the artist. We are continuing our education work with local schools, organising visits so that pupils can meet the artists, be inspired and enhance their curriculum studies, further raising our profile with parents and in the community. See the end of this note for how to get involved. Notification – Monday 14 February by email. The artists name and title of the work should be included as part of the file name. All submissions must be accompanied by a fully completed entry form, see below. Please keep a photocopy for your own record. Note: Tamar will acknowledge each submission on 14 February or within 48hrs. If by then you haven’t received a confirmation email that your images have been received, please contact her again. Only the work selected will be hung. Substitutes will not be accepted. Works should be committed for the length of the exhibition. Framing. All works on paper must be framed under glass unless otherwise agreed to prior to selection. Works on other surfaces need not be framed so long as canvases and similar edges are clean. All works must have D-rings and wire on the back. If D rings are not attached you agree to SLWA attaching them at a fee of £5 per work. SLWA reserves the right not to hang work which does not meet this specification. Labels will be placed with the work, including your name the title of the work, the price and your email so that sales can be arranged directly with you. Works hung in the Library will have electronic tags attached which will set off an alarm if taken past the barrier. You are recommended to have your works covered by your own insurance. We will ask you to sign a disclaimer. Details of the selection panel of professional artists and curator will follow later. Emily Druiff, director if Peckham Space and the curator of the next SLWA show in Dulwich, is pleased to announce the first Peckham Space OPEN exhibition and calls for artworks. This will be a unique exhibition that will showcase artworks that have a connection to Peckham. The exhibition will take place from 7 – 18 December 2010 at Peckham Space’s new venue on Peckham Square, London SE15. Your work must have a thematic connection to Peckham. Your work must be two dimensional ONLY. Your work must be ‘ready to hang’, ie: D-rings or wire on the back. You must be able to demonstrate that you work, study or live in the following postcodes: SE15; SE14; SE5. Your work must be under 0.75m x 0.75m in size. You will submit one artwork only in protective wrapping. Your work will not include glass or sharp objects. More information about the exhibition and how to submit here: Peckham Space OPEN /PDF/ and on the Peckham Space website. Dulwich Picture Gallery invites you to enter an online art competition based on the current exhibition Salvator Rosa. Salvator Rosa (1615-1673) was one of the boldest and most powerfully inventive artists of 17th-century Italy. He was adopted as a hero by painters of the Romantic movement in the late 18th and early 19th centuries. He was mainly a painter of landscapes, but the range of his subject matter was unusually wide and included portraits, scenes of witchcraft and allegories. 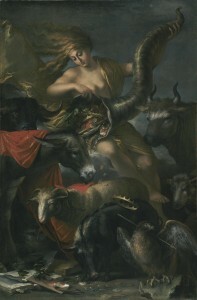 A group of the works in Dulwich Picture Gallery’s current Salvator Rosa exhibition transport the viewer into a mysterious world of monstrous mythical creatures, bandits and magic. Drawing from Salvator Rosa’s work and a famous myth, legend or fantasy novel depict your own allegorical scene. Your entry and a brief sentence about you (if you like) will be published on Dulwich OnView and the Friends of Dulwich Picture Gallery’s Flickr group TheRosa Competition. Any flat medium – painting, drawing, mixed media, photos etc. Ian Dejardin, director of Dulwich Picture Gallery, will choose one winner in each category and the other two will be chosen by you – a peoples vote. Salvator Rosa, Allegory of Fortune, about 1658-1659, Oil on canvas. You can view the Salvator Rosa exhibition at Dulwich Picture Gallery from the 15 September – 28 November 2010 where you will find plenty of inspirational ideas for the competition. The winners will receive an exclusive invitation to the next Friends’ Gallery Private View and a gift based on the exhibition. This competition is run by the Friends of Dulwich Picture Gallery’s DOV team. Digital entries are available to the Friends of Dulwich Picture Gallery for promotional purposes. Full credit given. Join our Flickr group – The Rosa competition and subscribe to Dulwich OnView. If anyone knows others please email SLWAeditor@hotmail.co.uk – thanks! Bow Cross Artist Residency (2010/2011) Acme Studios, in partnership with the Swan Foundation, is offering a 12-month residency to an artist to develop a project or projects centred on Bow Cross, E3. The selected artist will receive a bursary of £10,000 and £10,000 towards project costs. The residency is open to artists who either live or work in the London Borough of Tower Hamlets who can demonstrate a strong relationship with, or understanding of, the area. The residency is an opportunity for an artist whose work is, in the widest possible sense, reflective of or located in the area in which they live and/or work, and who has a strong professional track record of developing work which engages with local people. Dulwich Picture Gallery invites you to enter an online competition based on the current exhibition The Wyeth Family. 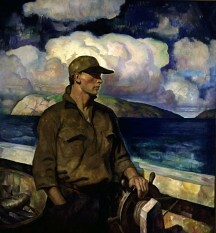 The Bank of America’s Collection of Wyeth Family works includes some beautiful portraits of the family and friends of these three generations of astonishing artists including Henriette Wyeth’s portrait of her husband Peter Hurd and N C Wyeth’s Young Maine Fisherman, a portrait of his son Andrew Wyeth’s friend, Portclyde Lobsterman Charlie Stone. Andrew Wyeth’s The Rebel is another beautiful example of realist portraiture. Using the exhibition as an inspiration, create your own portrait of your family or friends. Your entry and a brief sentence about you (if you like) will be published on Dulwich OnView and the Friends of Dulwich Picture Gallery’s Flickr group The Wyeth Family Competition. You can view The Wyeth Family exhibition at Dulwich Picture Gallery from the 9th June – 22nd August 2010 where you will find plenty of inspirational ideas for the competition. If you are interested in the longer term even if you can’t make this Thursday do let me know. Submissions and registration by August 27th 2010 for auction in Wimbledon on 27th September 2010. Another Lambeth Open event is planned for 2nd and 3rd of October 2010. Thanks to Tim Suttonwho also runs the Urban Art Fair in Brixton for the information. If you wish to attend or host future critiques, please email Liz Charsley-Jory liz.jory@googlemail.com, indicating as well if you would like to bring a piece of work along for critique. We were thinking it would be good to establish a monthly or bi-monthly timetable. In this way we can begin to get to know each other and share ideas, which is one of the aims of establishing this network of artists. The idea: Our series of critiques helps us enhance our professional development and benefit from the diverse range of practices within our membership. The idea is for those attending to offer productive critical comments from which the artists involved can derive fresh perspective on their practice. During my MA studies at Camberwell, I found this aspect of the course the most valuable in terms of gauging how my work was being interpreted by viewers, in ways that I would never have guessed. The idea of attending workshops is purely one to enable you to satisfy an interest in another medium, or to view another artists working method. As an artist offering a taster workshop, your workshop would be individually designed by you to fit in with your work practice,as will the times and dates offered and any costs incurred. The costs would not be to cover teaching costs as such,but would be to cover costs of outgoings such as materials, or in the case of life drawing, the cost of the model for example would be shared. Numbers would necessarily be limited to suit your workshop capacity,and would be filled on a first come first served basis. If you should wish to offer catering facilities please also indicate that possibility. Please email Chrissy Silver at silverchrissy@mac.com , if you would like to offer a workshop, and she will co-ordinate a list of forthcoming workshops from other artists.